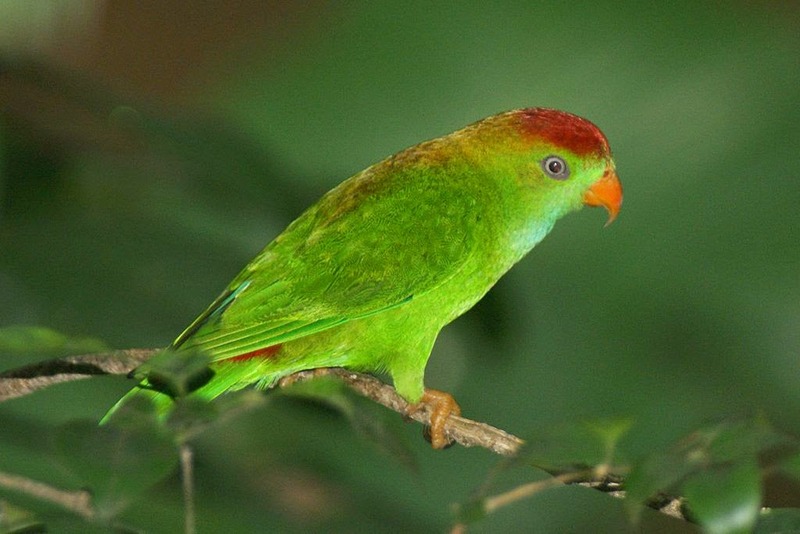 The Sri Lanka hanging parrot is a small, mainly green hanging parrot, only 13-14 cm long with a short tail. The adult has a red crown and rump. The nape and back have on orange tint. The chin and throat are pale blue. The beak is red and the irises are white. Immature birds lack the orange hue to the back, have a duller rump, and have only a hint of orange on the crown. They have a feint blue throat. They have orange beaks and brown irises. Sri Lanka hanging parrot is less gregarious than some of its relatives, and is usually alone or in small groups outside the breeding season. Its flight is swift and direct, and the call is a sharp whistled twiwittwit..twitwitwit. It undergoes local movements, driven mainly by the availability of the fruit, seeds, buds and blossoms that make up its diet. Sri Lanka hanging parrot is a bird of open forest. It is strictly arboreal, never descending to the ground. It nests in holes in trees, laying 2–3 eggs. ලොවෙන්ම ශ්‍රී ලංකාවට පමණක් සිමා වූ කුරුල්ලෙකි. කොළ පැහැති සිරුරේ හිසෙහි කිරුල හා නිතඹ රතු පැහැ ගනී. ගෙලහි හා පිට පෙදෙසේ ලා තැඹිලි පැහැ ගන්නා අතර උගුර නිල් පැහැතිය. ලංකාවේ සෑම කලාපයකම දැකිය හැක, තෙත් කලාපයේ වැඩි වශයෙන් දැකිය හැක.